Lots of people want a sustainable future – not all of them have the know-how to design it. How do you step out of doing what you’ve always done to design a rewarding career or a new lifestyle. 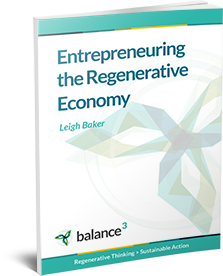 Being part of the Regenerative Thinking revolution takes more than good intentions – it takes time, focus and structure to make the shift. There’s a new way of thinking to learn, and a new set of communication and influencing skills to practice. Whatever level of sustainability you aspire to in your life, your personal effectiveness is a key factor in the results that you get. 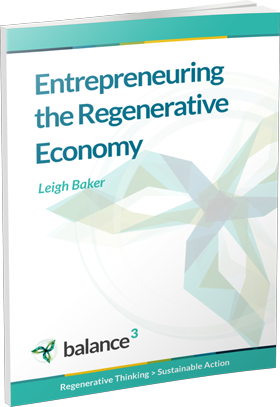 Getting Regenerative is a framework inside which you develop your understanding of Regenerative Thinking and explore “what’s in it for me?” What new ways of living, working and operating will empower you to be a successful change-maker, not just an activist? Getting Regenerative is a one-to-one program of coaching and training sessions that focuses on YOU and the difference you want to make in the world. It’s about aligning your values, your work and your passions to play a new and exciting game in the world. If your back hurts, you get it re-aligned – do the same for your life. Our standard program is 5 sessions, starting with a free needs evaluation where we make sure this program is right for you. Exactly how many and how often depends on where you are at and what it is that you want. Learn the basic principles of regenerative thinking and how to apply them to your career, purpose and values. Learn the skills of generative innovation that will increase your change-making success. Improve your ability to manage your time and your life to deliver more effectively.